In this post I would like to provide three clear, documentable examples of outright fabrications about autistics. For whatever reason some people seem to be under the impression that autistics are fair game when it comes to making up facts and statistics. Michelle Dawson notes that the 90% figure cannot be supported by peer-reviewed science, and challenges autism advocates to provide a supporting citation. I wanted to go further than that and verify if the figure can be supported by administrative data. Unless culture in California and Canada are considerably dissimilar, we should be able to learn something about institutionalization from the California Department of Developmental Services quarterly client characteristics report. Before looking at the data, I should emphasize that, as a rule, only individuals with autistic disorder are eligible for CDDS services. The data is not supposed to include those with PDD-NOS or Asperger's Syndrome. Further, I will look at data for adults, who by and large were probably diagnosed under DSM-III or Kanner's criteria, and who could not have been part of an ABA program in early childhood. Adults who at some point were in the CDDS system and decided they no longer required its services for any reason are obviously not included in the data. From the Q3 2006 report, we learn that 3,089 autistic persons do not live independently or at home with a parent/guardian. The report also says that there are 7,015 autistic adults (18 or older) in the system. So at most 44% of adult autistics in California do not live with family or independently. The actual figure could be lower depending on the number of children who do not live at home. Of those not living independently or with family, the vast majority live in Community Care. If we only count Institutional Care Facilities as "institutionalization", the figure is at most 4.75%. That's correct, less than 5%. It should also be noted that all of these rates are falling rapidly. A lot of these kids are so severe, you know, they don't say a word, they attack everybody, they break their mothers arm. These are really, really aggressive kids. Break their mother's arm? I wonder how often that really happens. The CDDS report won't tell us that, but it does have a category called "Severe Behaviors". From the latest report we learn that 16.31% of autistics in the system are classified as having "severe behaviors". That's roughly 1 out of 6. In the latest CDDS report we find that 28% of autistics of all ages in the system are classified as having some level of mental retardation. It's not clear how this determination is made. It is probably fair to assume there is some misclassification, and that a different type of testing would yield a different figure. In some cases a child may be presumed to be mentally retarded on the basis that he or she is unable to understand or comply with simple instructions. But the CDDS does have an "Unknown MR" category, which currently holds 6.75% of autistics in the system. The issue is not that it is bad for mental retardation to be associated with autism. Mental retardation is a neurological difference which does not in any way invalidate disability rights, neurodiversity or self-advocacy. The issue is how easily facts and statistics are fabricated when it comes to autistic people. A press release came out back in April titled Autism Has High Costs to U.S. Society, claiming that "it can cost about $3.2 million to take care of an autistic person over his or her lifetime" and that "caring for all people with autism over their lifetimes costs an estimated $35 billion per year." This is nothing but bigotry of the highest order. It's no different to this as far as I'm concerned. I'm aware such costs are studied in the context of a medical model of disability. The underlying assumption of this model is that disability is a burden that should be eliminated/cured. That's about the entire scope of the model. Never mind the track record of the model, or how realistic its goals, considering the inescapable reality that every person in the world will experience disability in their lifetimes, unless they die first. What I would like to do in this post, nonetheless, is scrutinize the numbers in the report. Let's start with the $3.2 million figure, assuming a life expectancy of 70 years for an autistic person. This would mean $41,714 is spent annually on the average autistic individual. I don't doubt some parents choose to spend that much in expensive ABA programs and such, but does it seem realistic that this is the average annual expenditure for an autistic from the day they are born until the day they die? Direct costs include direct medical costs, such as physician and outpatient services, prescription medication, and behavioral therapies (estimated to cost, on average, more than $29,000 per person per year) and direct non-medical costs, such as special education, camps, and child care (estimated to annually cost more than $38,000 for those with lower levels of disability and more than $43,000 for those with higher levels). Medical costs are documented in Croen et al. (2006). The excess annual medical costs for autistic children relative to controls is $1865, due mostly to the prescription of psychotropic medications. But that's for children. What of the lifetime cost? Let's multiply that number by 20, which gives $37,300. As to therapies, while maybe only 30% of autistic children are put in ABA programs, about 70% seem to undergo speech therapy, which is also pretty expensive. I won't dispute the $29,000 a year figure, but let's see what the lifetime cost might be. How many years are autistic children put through these therapies in average? Let's say 5 years. This gives a lifetime cost of $145,000. I won't consider expenditures in quackery, as this is not a cost of autism, but a cost of ignorance. Indirect costs equal the value of lost productivity resulting from a person having autism, for example, the difference in potential income between someone with autism and someone without. It also captures the value of lost productivity for an autistic person's parents. Examples include loss of income due to reduced work hours or not working altogether. Ganz estimates that annual indirect costs for autistic individuals and their parents range from more than $39,000 to nearly $130,000. The average annual income per person in the U.S. is about $30,000, so right there the figures provided in the article do not make sense. It appears that about 25% of autistic people diagnosed a generation back work and live independently. But the analysis is about autistic people diagnosed today under current criteria. Let me make an assumption here. About 25% happens to be the percentage of autistic people evaluated as not having mental retardation a generation back. Currently, that's more like 70%. I conclude that about 70% of autistics diagnosed today will live independently and work. (No, I'm not saying that only those without mental retardation work, or that none of those without mental retardation are out of a job -- I'm just using this as an artifact to estimate trends). So if we were to assume that the average income of a working autistic person is equivalent to the population average, annual wages lost per autistic person would be $9,000 a year. But that is a big if. Autistics might tend to have very low wage jobs. On the other hand, they might tend to have very technical jobs which are fairly well paid. Either way, let's assume $9,000 x 40 is lost in wages per autistic person over a lifetime, or $360,000. There are intangibles which aren't taken into account. How do we quantify the contributions of someone like Temple Grandin to the food industry? Or the contributions of Vernon Smith to, you know, ECONOMICS. Are we allowed to claim Bill Gates? His net worth is $53 billion, a tad more than the purported annual cost of all autistics in the U.S.
What I've estimated so far comes to a lifetime excess cost of $542,300 (minus big intangibles) per person. I do not believe it is anywhere near $3.2 million. Trouble is, a figure that is not in the millions won't make for big headlines. It is common knowledge by now that proponents of the link between thimerosal containing vaccines and autism have been left without any epidemiology to speak of. This is because the credibility of the two and only researchers involved in trying to demonstrate an epidemiological link between TCVs and autism, Mark and David Geier, has taken a substantial hit, due to the work Kathleen Seidel has single-handedly done to expose dubious activities related to the Lupron Protocol. As a result, it appears that an old talking point of mercury militants has acquired renewed importance. Roughly, they claim that an early draft of Verstraeten et al. (2003), which I'll refer to as Verstraeten et al. (2000), showed there was a link between thimerosal and autism, but this link was later covered up by the CDC. It's of interest to note that Verstraeten et al. (2000) is the same draft that was plagiarized by Geier & Geier. (No need to dance around the word plagiarism, as such is patently obvious). In order to verify the claims about Verstraeten et al. (2000) I decided to, you know, go and read the draft. Let's analyze the various claims. Is it true that Verstraeten et al. 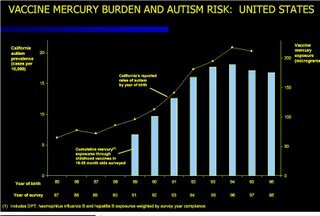 (2000) showed there was a link between autism and thimerosal? Simply put, no. The abstract does not mention autism. To see why that is the reader should look at relative risks for various outcomes after exceeding EPA mercury exposure guidelines at 1 and 3 months of age in Table 4. The relative risks for autism are 1.01 (CI 0.71, 1.48) and 0.94 (CI 0.62, 1.42). In other words, the relative risks found happen to be very close to 1.0 and the range of statistical confidence is broad around 1.0. Verstraten's first draft of the study finds a relative risk above 7 for children who receive the highest dose of thimerosal to develop autism. What is she talking about? Graph 4 shows relative risks at different exposures. At greater than 62.5 micrograms (by 3 months of age) the relative risk is 1.69. But note that 1.0 is well within the confidence interval. There is no way to conclude a relative risk greater than 1.0 is statistically significant in this case given the sample of 28 children. I will also discuss other reasons why these relative risks can't be taken at face value. Either way, it's not clear where Ginger got the relative risk of 7. Is it true that Verstraeten et al. (2003) covered up the findings of Verstraeten et al. (2000)? RESULTS: In phase I at HMO A, cumulative exposure at 3 months resulted in a significant positive association with tics (relative risk [RR]: 1.89; 95% confidence interval [CI]: 1.05-3.38). At HMO B, increased risks of language delay were found for cumulative exposure at 3 months (RR: 1.13; 95% CI: 1.01-1.27) and 7 months (RR: 1.07; 95% CI: 1.01-1.13). In phase II at HMO C, no significant associations were found. In no analyses were significant increased risks found for autism or attention-deficit disorder. These results appear to be similar to some of those in the early draft. The difference is that the 2003 study includes additional HMOs. But maybe Verstraeten et al. are pretty bad at covering up data. There's a whole mythology of conspiracy surrounding Verstraeten, the VSD and, you guessed it, the Geiers. See Kev's post titled Mark Geier, David Geier and the VSD. What about the risk ratios for outcomes other than autism? That autism is not involved doesn't mean I will just ignore the rest of the findings. The early draft does find statistically significant risk ratios for several outcomes. But is there good reason to take these ratios at face value? Those familiar with vaccine safety studies generally understand that VSD is a much more solid database than VAERS. That is, you can't literally plant data in VSD, and VSD is not likely affected by prevailing causation hype or the interests of litigants. This, however, doesn't mean VSD is impervious to confounds beyond random error. VSD still records outcomes based on existing diagnoses, not the results of whole population screenings. In a cohort of children expanding many years, recent diagnoses are not necessarily equivalent to older diagnoses. Surely, things like coincidental trends and left censorship could have an impact on any findings. After looking at graphs in the 2000 draft, I came across a number of peculiar results. I will list some examples, so the reader can get a clear idea of whether risk ratios from the draft can be taken at face value. In Graph 1 we find that if you inject children with more than 62.5 micrograms of mercury by 3 months of age, their risk of developing degenerative neurological disorders is only 40% of what it would be otherwise. And this is a statistically significant finding. In Graph 3 we find something similar about renal disorders. Apparently mercury is good for your kidneys. Graph 15 says about the same about infantile cerebral palsy. In other words, thimerosal prevents brain damage. Graph 8 shows that risk for sleeping disorders increases by a factor of 1.75 with a exposure of 50 micrograms. The solution? Inject more thimerosal. Apparently with a exposure over 62.5 micrograms, the risk drops back down to 1.09. Graph 13 tells us that the risk of developmental speech disorder is only 0.59 at 25 micrograms of exposure, even though the risk is between 1.25 and 1.47 at higher exposures. I guess you have to be careful to choose the right dose if you want to prevent almost half the cases. Graph 20 is the most peculiar of all. It tells us that premature infants would have about a fifth of their normal risk of developing neurological disorders if only they are injected with 50 micrograms of thimerosal. And this finding is quite statistically significant, as the sample sizes in this graph are considerably larger than in other graphs. It is clear that it would've been irresponsible for Verstraeten et al. to just publish these findings without clearly outlining limitations and potential confounds. This is not only because of the anti-vaccination scare that would result, obviously. So maybe they did think about that and that's why they decided to look at more HMOs. Which is a good thing. The purpose of this group is simple - to discuss what is and what isn't neurodiversity. There are no formal principles or rules but there is a lot of (mis)information about what neurodiversity is and what it means on a realistic basis as well as a principled basis. Hopefully this Group will serve to set the record straight. Trolls (yes, we all know who you are) are not welcome. Is the TV Hypothesis More Plausible than the Thimerosal Hypothesis? This is sure to rattle some sensitivities, but that's just too bad. It is on record that I consider the TV hypothesis to be almost certainly false (see my analysis and additional critiques in the comments section). This, nevertheless, does not preclude me from contrasting and comparing this hypothesis with any other hypothesis on their merits. I have been accused of all sorts of things for doing this. One commenter (Erik) even insinuated I must be in the pockets of the CDC or Big Pharma. The same insinuation has been made about the Cornell researchers who did the TV study, and I have seen that in several blogs and mailing lists. What is the scenario here? Are we to believe that the CDC had a meeting where they decided to pay a group of economists to conduct an epidemiological study involving cable subscriptions and annual precipitation rates? Right! "Shhh... just don't tell anyone Mr. Economist." BTW, did any whistleblowers come forward yet? This type of conspiracist paranoia is suggestive of something. It is apparent that to many the TV hypothesis is not a laughing stock, but actually very serious business. Its impact has been significant among the more anti-vaccination elements of the community. Hundreds of messages have been posted to the EOHarm mailing list about this study, many of them very angry messages. The researchers have been harassed by email, and probably even by phone. (See Kev's post on the subject). Time Trends.- In the last several decades, there is only one period of time when thimerosal exposure increased consistently and significantly in the US. 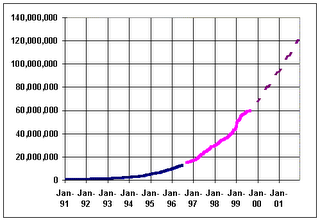 That is the period between the birth years 1990 and 1994. At other times, thimerosal exposure has been either fairly stable or declining. 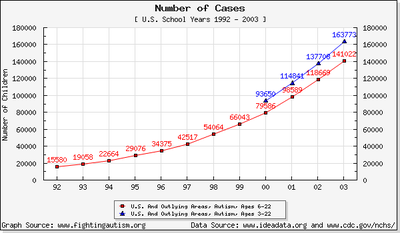 In contrast, the administrative incidence of autism has been on a smooth upward trend for several decades, most notably in the 1990s. Roughly the same could be said of TV exposure. 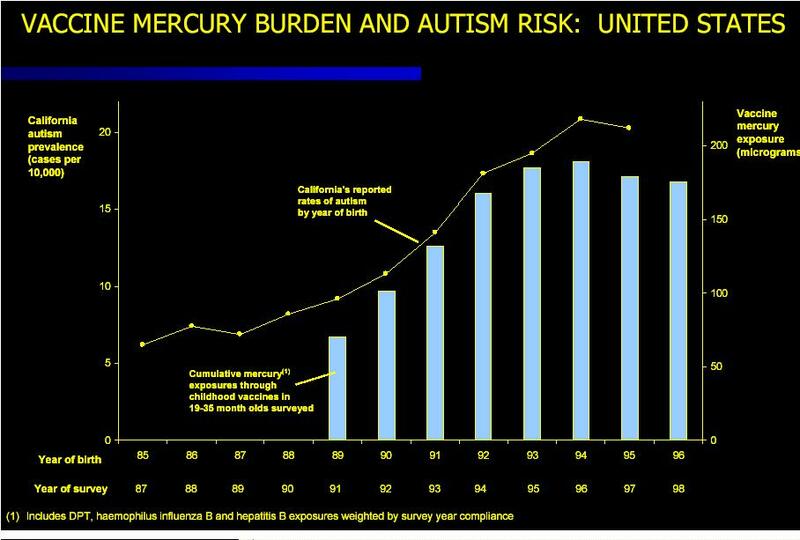 Regional Epidemiology.- No regional epidemiology exists involving thimerosal and autism, nor is it likely the thimerosal hypothesis could explain both a significant rise in autism incidence over time and the considerable differences in autism prevalence across states and counties. In contrast, the TV study presents a per-county analysis across several states for both cable subscription rates and precipitation rates. The cable subscription analysis even adjusts for time-independent per-county effects. Credibility of Researchers.- The only thimerosal epidemiology which can be found in the scientific literature has been authored by Mark and David Geier. The scientific conduct of these researchers has come under fire recently amid allegations of affiliation misrepresentation, IRB irregularities, use of dual terminology, misrepresentation and alteration of cited work, apparent plagiarism and use of salami publications, potential breaches of confidentiality, unreproducibility of results, omission of data, a suspect "order of magnitude" error, conspirationism and fear mongering, and assorted fabrications. Their conflicts of interest include having filed a patent application for their "Lupron Protocol", and, astonishingly, a connection to a pharmaceutical company. A quick search reveals nothing comparable about Waldman et al. Extent of Exposure.- The peak thimerosal exposure in the US from all vaccines combined was about 180 micrograms (in 1994). Each vaccine contained as much as 25 micrograms of thimerosal. A conservative estimate (by Sallie Bernard, no less) suggests an average tuna sandwich contains 12 micrograms of methylmercury. However, if we consider that 6 oz. of albacore tuna has 60 micrograms of methylmercury, a tuna sandwich could have over 30 micrograms. Either way, TV exposure appears more significant. Autistic children can watch TV for hours a time, day after day, sometimes asking to watch the same DVD over and over again. Strengths & Impairments.- From the very beginning autistic people were described as having areas of strength and impairment. It seems difficult to come up with a model by which brain poisoning would result in cognitive strengths. But it is not impossible to imagine how television might cause certain impairments over time while enhancing other areas of perceptual functioning. Removal of Thimerosal.- Thimerosal is considered to have been largely removed from vaccines in the US territory by 2001. But it has been removed in other countries too. It was removed in Sweden and Denmark in 1993. It was removed in Canada in 1996. It was removed in the UK (not sure about the year). 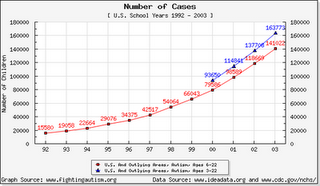 Yet, no country has ever reported a decline in the incidence of autism, not even anecdotally. No one has ever said, "hey, wait a minute, there are less little ones with autism now" (well, actually, I know a pair of characters who have claimed just that). The TV hypothesis doesn't have something so obviously damning against it (yet). Anecdotal Evidence.- It's early to draw a controlled comparison, but I'll quote something from Jennifer: "By the way, my child did regress at about the same time as she became very interested in watching TV. I've wonderered for years if it wasn't a factor in her gradual social withdrawl. I was so interested that I set up a survey. I asked parents if they had found various therapies helpful (or not). One of the questions was about 'Cutting back on television/video watching'. That received 24 favorable votes, compared to 4 unfavorable, which compared quite respectably to the top therapies which were speech/language therapy which received 38 votes for and 4 votes against, and ABA which received 31 votes for and 3 votes against. Chelation was much less favored, with only 6 postive, and no negative votes." Are there areas in which the thimerosal hypothesis looks better than the TV hypothesis? Maybe. But I'll just let readers comment on those.